The Asian Human Rights Commission (AHRC) has obtained details of another case in Burma speaking to the country’s “injustice system” and how it affects the rights of all citizens in different ways. In this case a man who repeatedly called the government electricity supplier to complain has been jailed under a restraining order, even though by law this order should be used only for a serious habitual offender. He is also on trial for obstructing a public official. The maximum sentence under that charge is three months; he has already been detained for more than two months. In the early morning of 2 August 2009, 46-year-old U Khin Maung Kyi called the electricity supplies department in the area of Rangoon where he lives to complain about a surge in electricity at his house. When he called, he argued with the duty officer and then asked to speak to his superior, but the officer said that he wasn’t available. He also refused to give his name. Then Khin Maung Kyi threatened to make a complaint at the headquarters. As the electricity supplies department already had a criminal complaint in the local court against Khin Maung Kyi for allegedly obstructing the work of their staff, on August 3 its township director sent a letter to the police to ask for further action against him, and the next day also sent a letter to the court. After that, on August 5, local officials decided to take further legal action against Khin Maung Kyi. They gave the reason as his telephoning the electricity supplier, but also made other general complaints against him, such as that he had encouraged people to vote No for the new constitution that was passed in 2008, and had taken photographs of flooding after heavy rain. On the same day the township council sent a letter to the police to get an order for a security bond, which means that Khin Maung Kyi would have to appear in court and have two people lodge an amount of money as a guarantee of his good behaviour. The council said that he had meddled in administrative affairs and had supposedly contacted an overseas radio station, but when the matter came into court couldn’t give any evidence of this or even any information about which station or the date or on what matter Khin Maung Kyi had contacted. On August 11 the bond case was opened against Khin Maung Kyi and two weeks later Judge Win Swe issued the order for a one-year bond, but because of the pending criminal case, Khin Maung Kyi was sent to prison. He has been there for two months so far, even though the charge of obstruction has a maximum sentence of three months. The case of obstructing a public servant is frivolous, but the bond order that has put Khin Maung Kyi in jail is completely ridiculous, because the law is very clear that the purpose of this order is for restraint of known habitual criminals on whom information has been received that they are likely to commit another offence. The judge is supposed to examine the case closely before giving the order, to make sure that such information really exists and that the person is a danger to the society. It is not a law that is designed for officials to jail people who have annoyed them. Further details on the facts of the case are provided in the sample letter below, as usual. The AHRC has been documenting numerous cases speaking to what it has described as Burma’s “injustice system”. Last week it issued an appeal on the case of underage girls who were jailed after the police allegedly presented false evidence about their ages to court and the judge failed to inquire after contrary evidence was given: AHRC-UAC-131-2009. Other recent cases include: AHRC-UAC-125-2009, AHRC-UAU-024-2009, AHRC-UAC-110-2009, AHRC-UAC-107-2009 and AHRC-UAU-018-2009. 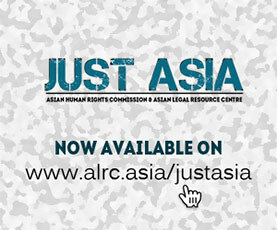 More cases can be accessed by going to the appeals homepage and typing “Burma” or “Myanmar” into the search box: http://www.ahrchk.net/ua/. Two special reports have also been issued in the article 2 periodical, “Saffron Revolution imprisoned, law denied” (vol. 7, no. 3, September 2008) and “Burma, political psychosis and legal dementia” (vol. 6, no. 5-6, December 2007). There are also a number of related sites, including the AHRC Burmese-language blog, Pyithu Hittaing, and the 2008 AHRC Human Rights Report chapter on Burma. Please write to the persons listed below to call for the immediate release of U Khin Maung Kyi. Please note that for the purposes of the letter Burma is referred to by its official name, Myanmar, and Rangoon, Yangon. Please be informed that the AHRC is writing a separate letter to the UN Special Rapporteurs on Myanmar and the independence of judges and lawyers, the UN Working Group on Arbitrary Detention, and the regional human rights office for Southeast Asia calling for interventions into this case. I am appalled to learn that a man has been jailed in Myanmar for making complaints about electricity supply and urge that he be released immediately. According to the information that I have received, on the mornings of 2 and 3 August 2009, U Khin Maung Kyi called the electricity supplies department in Hlaing, Yangon to complain about electricity supply to his house. When he called, he argued with the duty officer and then asked to speak to his superior, but the officer said that he wasn’t available. The officer refused to give his name. Then Khin Maung Kyi threatened to make a complaint with the department headquarters in Naypyitaw. On August 3 the township electricity supplies department sent a complaint to the police and on August 4 to the township court, for the reason that the department already had a criminal complaint of obstructing a public servant pending against Khin Maung Kyi. On August 5, seven officials under the Ward 13 Peace and Development Council attended a meeting headed by U Naing Oo at which they decided to take seek the bond order against Khin Maung Kyi for disturbing public order. On August 5 and 7 the Hlaing Township Peace and Development Council sent letters to the township police to instruct action against Khin Maung Kyi for frequently calling to complain about electricity supply, for similarly calling to the township office, for “meddling” in local administrative affairs, for allegedly distributing “unwanted” news, and for allegedly contacting to an overseas radio station. On August 11 the case was opened against Khin Maung Kyi and on August 25 Judge Win Swe issued the order for a one-year bond of 50,000 Kyat (USD 50) from two guarantors, but because the criminal case is pending Khin Maung Kyi was held in prison instead of being allowed out on the bond. Both of these laws have obviously been flagrantly misused to persecute a man whose only “crime” was to irritate some government personnel. The law on bonds is intended for restraint of known habitual criminals on whom information has been received that they are likely to commit another offence, not ordinary citizens who make complaints. It is also the obligation of the judge in giving an order to fully examine the case and be satisfied that there are grounds for issuing the bond. The Court Manual states clearly that, “No person should be called upon to give security except upon credible, clear and substantial information… that the person informed against is leading an habitually dishonest life and, in the sense, is dangerous to society” (Chapter 16, section 376). It is ludicrous to think that Judge Win Swe in this case had inquired properly and found reason for giving the order. Secondly, there are no genuine allegations against the accused of relevance to the charge of obstructing a public servant simply because he is a frustrated consumer of a bad electricity supply. The claim that he contacted to an overseas radio station, when put to the court, was found not only to be without evidence but the officials could not say what station, what day; what time or on what topic he had contacted. Not only is its application in this case absurd, but also the penalty carries a maximum sentence of three months. Khin Maung Kyi has already been detained for two months and the trial in this case is not completed. For these reasons I ask that first, the bond order be immediately lifted; and second, that the accused be granted bail while a review of the charge of obstructing a public servant is undertaken so that that case also be dropped. I also ask that the government officials involved in bringing this frivolous complaint against an ordinary citizen be investigated. I am aware that the government of Myanmar encourages the making of complaints to offices in Naypyitaw, but it is clear from this case that if local officials are left free to bring false criminal cases against people who do complain or threaten to complain then senior officials are not likely to learn about their causes for complaint. If senior government officials are serious about the policy of allowing complaints then they must act against officials who are found to have been working to prevent people like Khin Maung Kyi from taking their grievances to a higher level.